McGill students voted on a motion that would prompt their representative body to condemn all violence against civilians during Israel’s most recent invasion of Gaza on Wednesday at the William Shatner University Centre. But as debate on the issue opened to the floor, the President of the International Relations Student’s Association of McGill, Ameya Pendse, presented a new motion. 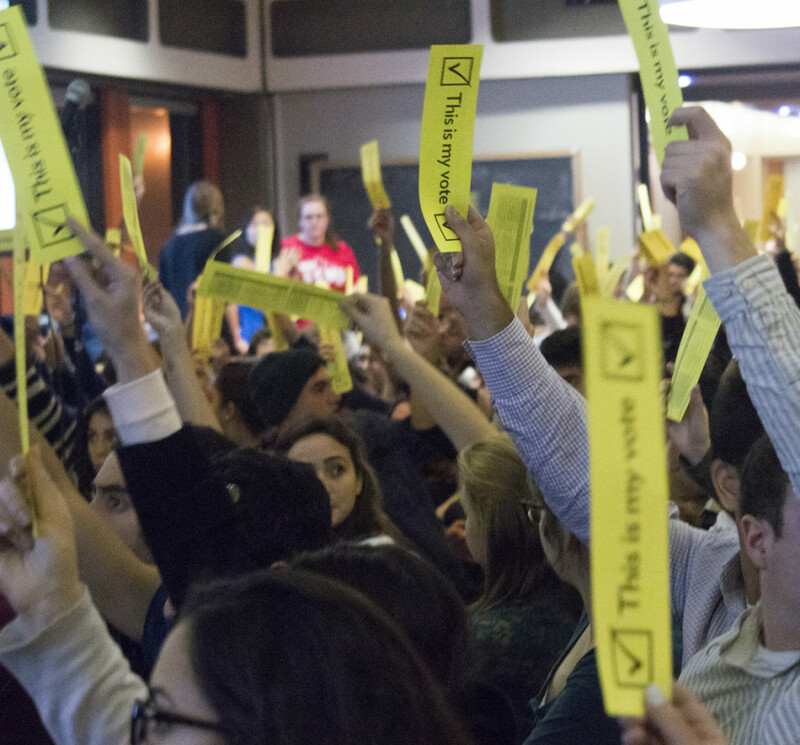 “Please vote to postpone this forever,” Pendse said, adding that if a debate were to take place, it would create a divide between students—many of whom claim such a divide already exists. The motion was debated at the Students’ Society of McGill University’s Fall General Assembly, where issues like weapons research at the university and action against climate change were also on the agenda. However, most of the nearly 800 students present were there to try and sway the outcome of the motion presented by McGill Students in Solidarity for Palestinian Human Rights, and debate the issue of human rights in Gaza. 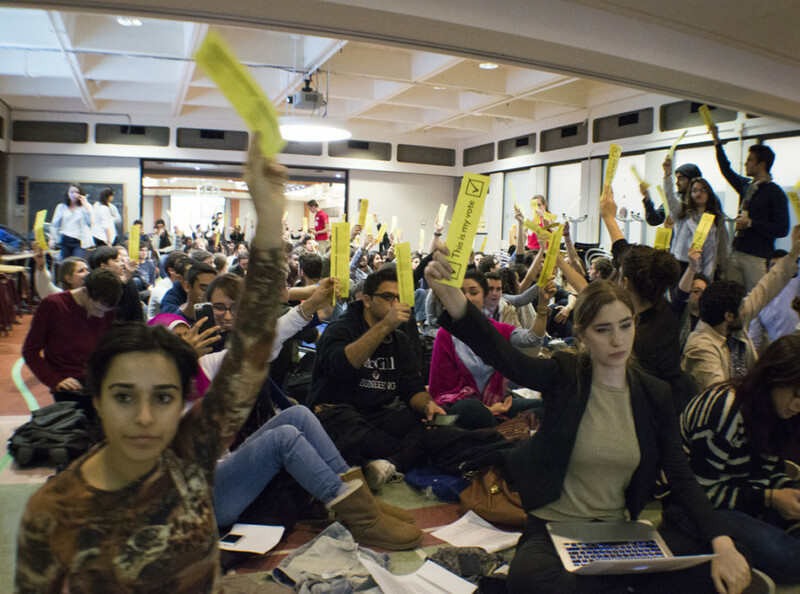 For almost two hours, students debated whether or not to postpone the original motion. The postponement passed with approximately 54 per cent of those present in favour. Sami Fuller was a supporter of the Yes campaign and was hoping to express his concerns regarding current issues in Gaza. “They are probably very uncomfortable with the idea of people discussing Israeli human rights abuses, the occupation, the siege, which are all illegal and in our opinion pretty much indefensible,” said Fuller. McKenzie Kibler, a third-year arts student and supporter of the motion to postpone, told the assembly he does not want a student union to speak on his behalf, especially on an issue as divisive as this one. Supporters of the Yes campaign were particularly frustrated with arguments like Kibler’s, citing the student union’s constitution and past positions. However, the No campaign argued the general assembly was simply the wrong place to discuss Israel’s operations in Gaza. The debate will not be rehashed at McGill for at least a few months, but Concordia’s turn is fast approaching. The CSU has adopted a similar motion to be presented in a referendum question this November.